Volunteering opens doors to new opportunities for you and helps people in your community. We’re here to help you get started. 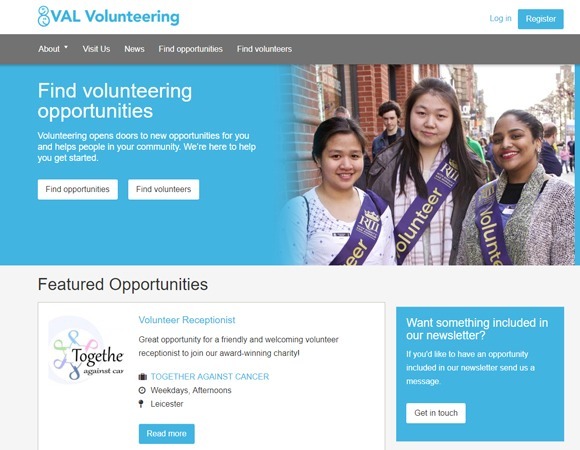 Our VAL Volunteering website is the place to go to find volunteering opportunities in Leicester and Leicestershire. You can register on the site, search by the things you’re interested in, and apply directly to any one of hundreds of opportunities posted by organisations. You can also read news about volunteering and learn about some of the benefits volunteering can have for you. Search hundreds of volunteering opportunities and apply directly to organisations who are looking for volunteers just like you. Our city centre volunteer drop-in service is available three days a week for you to come in and speak to us about volunteering. Self-service computers are available for you to come in and search on the VAL Volunteering website on your own. Our Involved newsletter is your monthly update on volunteering related news and exciting volunteering opportunities.